Hover the cursor over a name or a relationship to show comments below. Or click on the family tree to make the info below "stick" so that you can access links, scroll down, etc. Old Welsh poems contain a few references to Uther Pendragon, but the most complete version of his story was first written down by Geoffrey of Monmouth in his Historia Regum Britanniae (History of the Kings of Britain). An ambiguous character, Uther is described as a strong king and a leader in battle. But he also, with Merlin's help, tricks the wife of his enemy Gorlois, Lady Igraine, and sleeps with her, conceiving Arthur. In Geoffrey of Monmouth's Historia Regum Britanniae, Ygraine (or Igerna) is the wife of Gorlois, Duke of Cornwall. King Uther Pendragon falls in love with her and attempts to force his attentions on her at his court. She informs her husband who departs with her to Cornwall without asking leave. This sudden departure gives Uther Pendragon an excuse to make war on Gorlois. Gorlois conducts the war from the castle of Dimilioc but places his wife in safety in the castle of Tintagel, where with Merlin's aide Uther gains entrance and conceives Arthur. A duke of Cornwall and Ygraine's first husband before her marriage to Uther Pendragon, according to the Arthurian legend. [Avalon] is the place where nine sisters administer genial rule over those who come to them from our homelands, and the first of them is the more learned in the art of healing, and her beauty exceeds that of her sisters. Her name is Morgan and she had learned what the use is of every kind of plant in curing the weaknesses of the body. She also knows the art of changing her appearance and of flying, like Daedalus, through the air on curious wings. As she wills it, she can be at Brest or at Chartres or at Pavia; and as she wills, she comes from the skies to your shores. In later medieval legends, Arthur is the epitome of knightly chivalry, king of the storied Camelot. But most scholars agree that Arthur, if he did indeed exist, was most likely not a king at all but a 5th-century British warlord, whose name grew in legend after hesucceeded for a time in combating the invading Saxon armies. 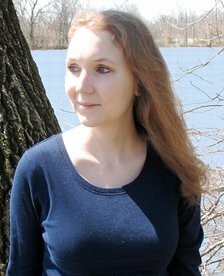 For an excellent summation of the historical sources for Arthur, see: www.sarahwoodbury.com/?p=660. Gwynefar was the legendary queen consort of King Arthur. The earliest Welsh form of her name, Gwenhwyfar, can be translated as The White Enchantress, or alternately The White Shadow. In some versions of the legends, she is the daughter of King Leodegrance of Cammelerd. Modred (alternatively Medraut, Medrod, or Mordred) is first mentioned in the Welsh historical chronicle the Annales Cambriae entry for the year 537: The strife of Camlann, in which Arthur and Medraut fell. Several scholars have pointed out that there is nothing to indicate what Modred/Medraut's relationship to Arthur may have been; indeed, to judge by this reference they could even have been allies fighting on the same side. Only in later tradition does Modred become the great villain of the Arthurian cycle of tales. Tradition varies on his relationship to Arthur, but he is best known as Arthur's illegitimate son. In later medieval versions of the Trystan and Isolde legend, Isolde (alternatively spelled Iseult, Iseo, Yseult, Isode, Isoude, Esyllt, or Isotta) is an Irish princess and renowned healer, forced into an arranged marriage with King Mark of Cornwall despite her love for Mark's nephew, Trystan. Their story occurs against the backdrop of Arthurian legend, with Arthur's famous knight Lancelot giving Isolde and Trystan shelter at his estate, The Joyous Garde. 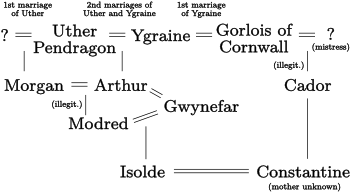 In the earliest Welsh versions of the legend, however, Isolde's parentage is not specified, though the love triangle between Isolde, Mark (or March or Marche), and Trystan still occurs. My Isolde, then, is a composite of the early Welsh and later medieval legend. I've kept her skill as a healer, but woven her story into the earliest versions of the King Arthur legend by making her the daughter of Modred and Gwynefar. In Geoffrey of Monmouth's History of the Kings of Britain, Cador, Duke of Cornwall, is said to be of Roman stock. His son Constantine was given the kingship of Britain by Arthur as the latter lay ailing on the field of Camlann. In the Brut Tysilio, the translator adds the information that Cador was son of Gorlois. Constantine was a minor king in 6th-century sub-Roman Britain, who was remembered in later British tradition as a legendary King of Britain. The only contemporary information about him comes from Gildas, who in his De Excidio et Conquestu Britanniae, calls Constantine king of Damnonia, a kingdom generally interpreted as including Cornubia or Cornwall. Much later, Geoffrey of Monmouth included the figure in his pseudohistorical chronicle Historia Regum Britanniae, adding fictional details to Gildas' account and making Constantine the successor to King Arthur as King of Britain. The earliest reference to Morgan as Arthur's sister comes from Chrétien de Troyes's romance, Erec and Enide, completed around 1170. However, her specific parentage is not specified. Only in the 13th-century Lancelot-Grail (Vulgate Cycle) does she become the youngest of Gorlois and Igraine's daughters, sent to a convent when Uther Pendragon kills her father and marries her mother. Since this explanation of her parentage occurs so late in the development of the legends (and nearly 800 years after the time period in which I'd set my story) I chose to make my Morgan Uther's daughter rather than Ygraine's. This is one of the seminal elements of the King Arthur legend, first appearing in Geoffrey of Monmouth's Historia Regum Britanniae. Uther Pendragon falls in love with Igraine, wife of Gorlois of Cornwall and wars with Gorlois for her hand. Merlin casts a spell that disguises Uther in the form of Gorlois, allowing him entrance to Ygraine's bedroom. They conceive Arthur, though unbeknownst to either of them, the real Gorlois has been killed in battle that very night. Ygraine later marries Uther. Brut Tysilio is the earliest source that identifies Cador as the son of Gorlois. In later legends, Morgan is often portrayed as an evil seductress who entraps Arthur into conceiving the evil Modred, who eventually becomes Arthur's killer. But Morgan can also be seen as a representation of the feminine power revered by ancient Celtic spirituality. Thus the later portrayals of her as an evil seductress can been seen as a reflection of the Christian influence that began to creep into retellings of the Arthur legend as the Christian faith in Britain grew. As the new religion replaced the old pagan beliefs, the myths of Celtic culture also changed: goddesses were transformed into evil witches, gods into demons, or alternatively Christian saints. In the most commonly known versions of Arthurian legend, Lancelot is the lover of Arthur's wife Gwynefar. But in Geoffrey of Monmouth's earlier version of the Arthurian story, Lancelot actually does not appear, and it is Modred who betrays Arthur by marrying Queen Gwynefar. The addition of Isolde as the child of Modred and Gwynefar's affair, though, is purely my own invention. Geoffrey of Monmouth's History of the Kings of Britain lists Constantine as the son of Cador. The marriage of Isolde and Constantine is purely my own invention; neither in history nor in legend is Constantine's wife mentioned.